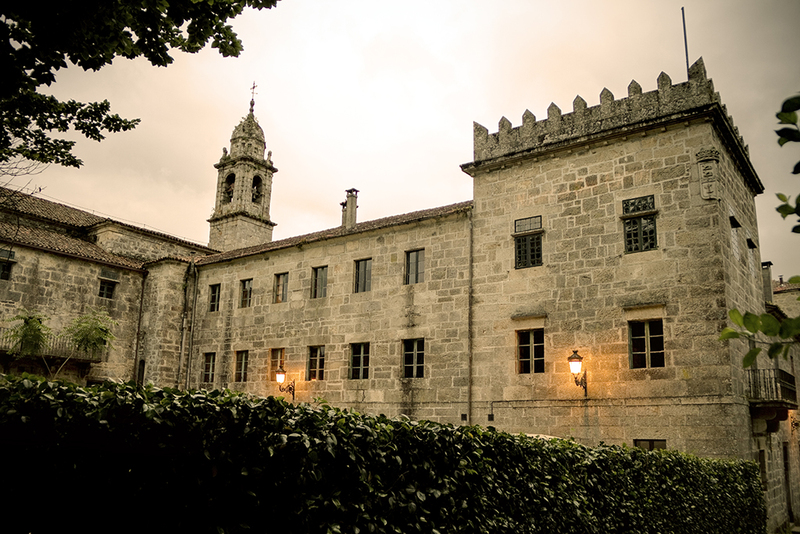 The Pazo de San Lorenzo de Trasouto is an extraordinary building situated in the heart of Santiago de Compostela, a city declared world heritage site by UNESCO. It stands surrounded by forest and splendid walled gardens occupying more than 40.000 m2 of surface. 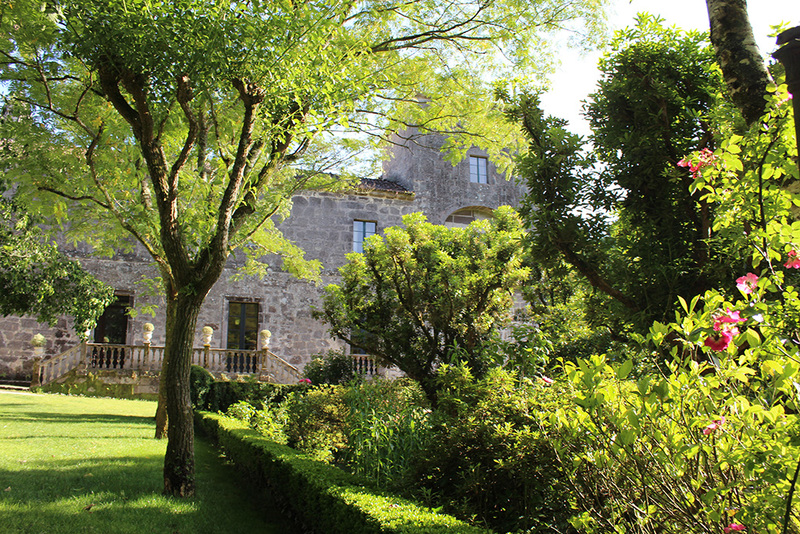 The Pazo de San Lorenzo, which is part of National Artistic Heritage, besides having a great historical value, also boasts traditional charm of Galician pazos. Founded in the XIII century, since XV century it was the property of Counts of Altamira. At present it belongs to their descendants the Dukes of Soma and Medina de las Torres. In 1216 a small hermitage dedicated to San Lorenzo was founded by D. Martin Arias the bishop of Zamora, who was originally from Santiago and whose Bull of establishment given by the king Alfonso IX of Leon is preserved in the Cathedral of Santiago archives. According to legend, D. Pedro Muñiz, falsely accused of necromancy, retreated here during that first stage. Later on, in XV century, it became the property and patronage of the Counts of Altamira. They left the usufruct of the monastery to the Franciscan Order which occupied it until its confiscation by the state in XIX century. 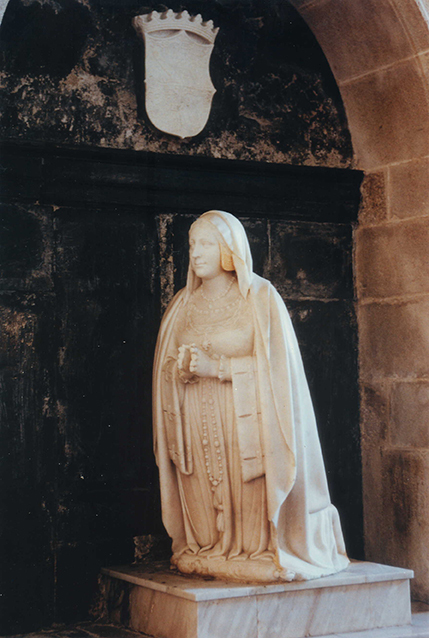 The Duchess of Medina de Altamira, current owner’s great grandmother, as Count of Altamira’s daughter and heiress filed a lawsuit against the State to recover the monastery as it did not belong to the monks and it was ruled in her favour. In 1520 emperor Charles V retreated here during the days of Easter. There are still remains of the primitive Romanesque construction that can be found in the inferior part of the church. The high altar and the praying statues of the Marquises of Ayamonte D. Francisco de Zúñiga and Da Leonor Manrique were in Seville in the church of San Francisco, also property of the family. When the church was torn down the founders’ descendants assumed the care of the marble and in 1882 the Duchess of Medina de las Torres installed them in this monastery, sponsored by her House. 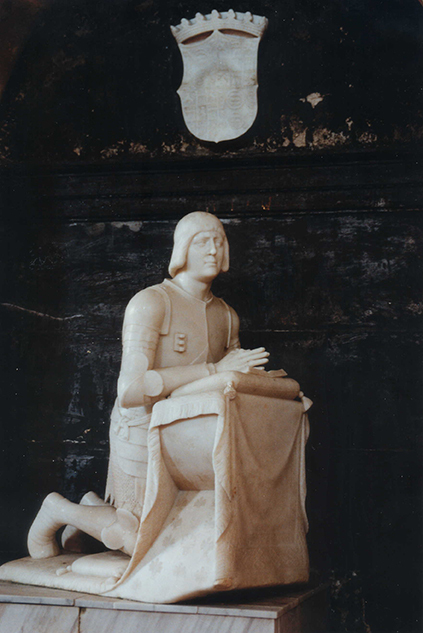 The marble is the work of XVI century Italian masters, it is executed in Carrara marble by brothers Aprile and Pier Angelo. 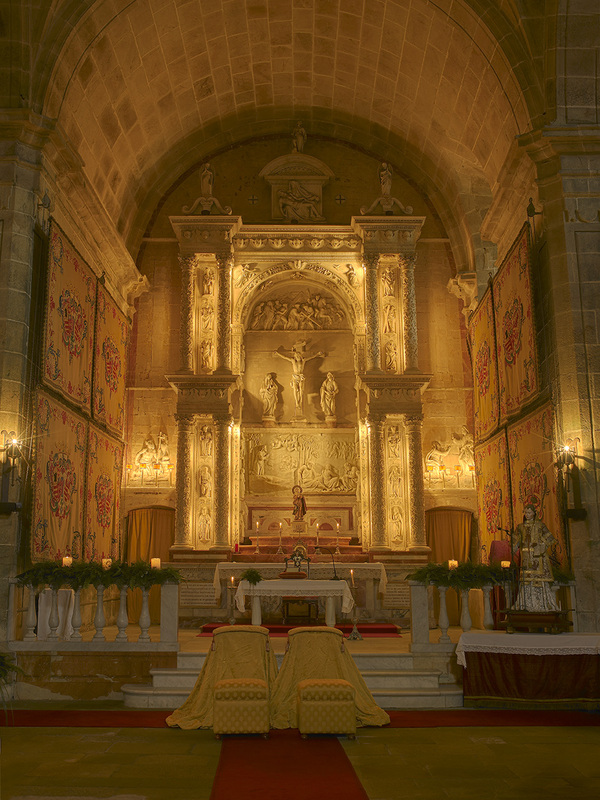 The magnificent altarpiece and sepulchre were commissioned and financed by the Marchioness of Ayamonte to honor the memory of her husband, who passed away very young. 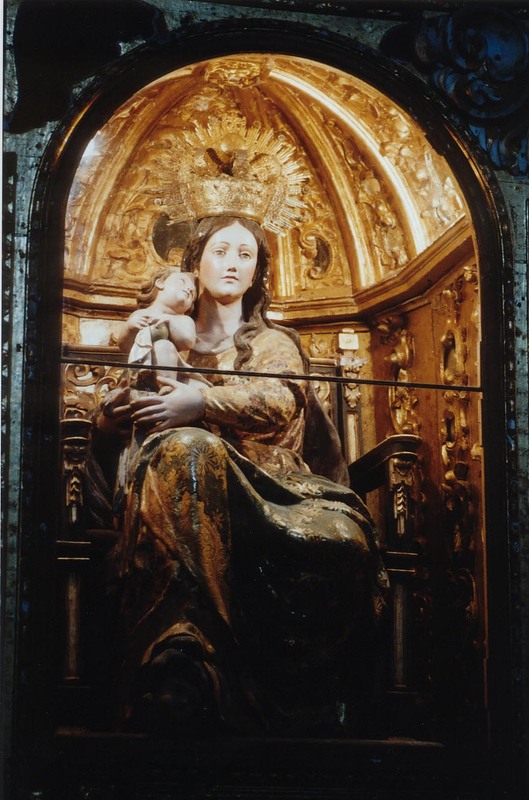 The image of the Virgin with the child, which can be found in a side altar, is the work of a Sevillan sculptor Martínez Montañés (XVII century). 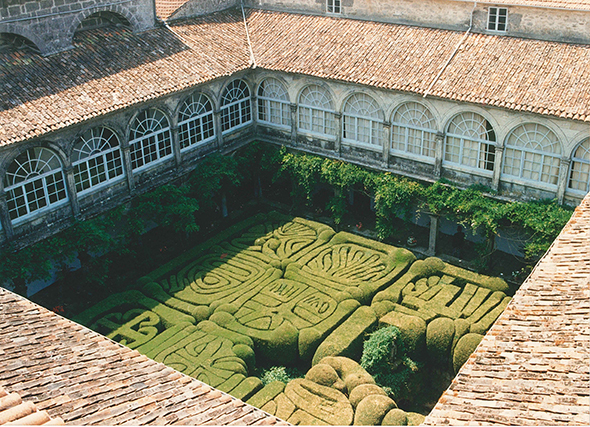 The XVII century cloister and the box shrub with allegorical designs have been preserved since the same period. Above the fountain there is an image of the Virgin dating back to XV century. The garden preserves its convent origin and in its old oak forest the Galician poet Rosalía de Castro spent a lot of hours getting inspiration for her verses. 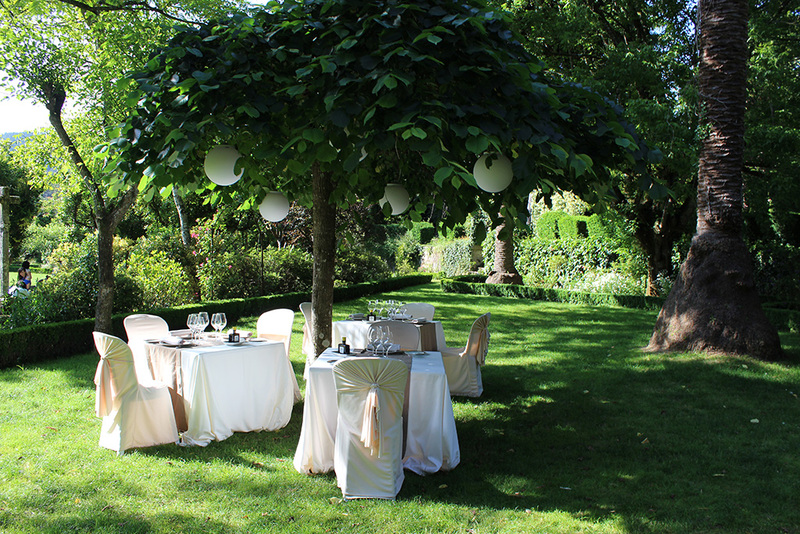 The gardens, lush and shady, date back to XIX century preserving their convent origin and romantic style of the age of their design. 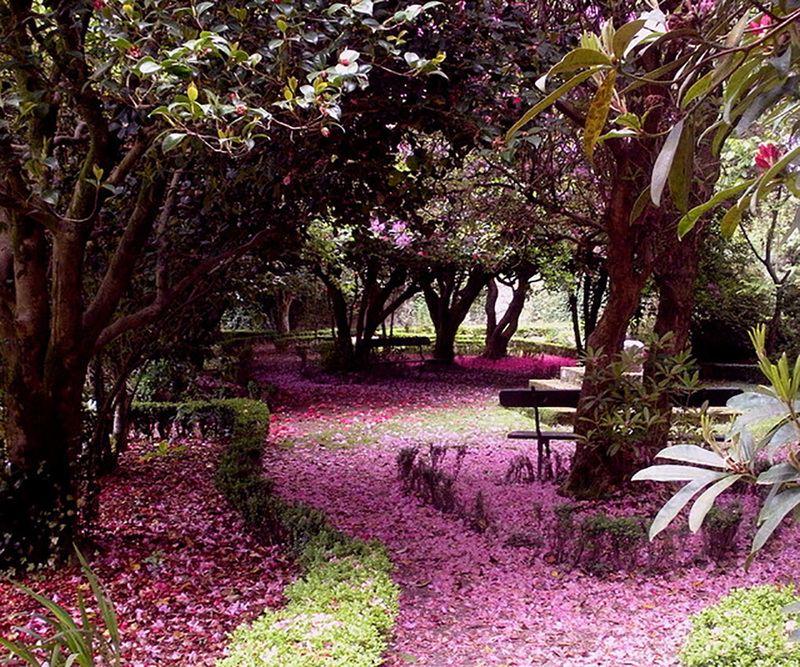 The camellias and magnolias, beeches, azaleas, hydrangeas, dahlias, gardenias or orange trees and hundred year old oak trees are among more than 100 plant species growing all over the estate of the Pazo which is divided into different parts: the terraced garden, landscape garden, horticultural and the forest. The cloister houses the most relevant piece of Spanish geometric gardening from the religious standpoint as well as the most valuable jewel of the Pazo. 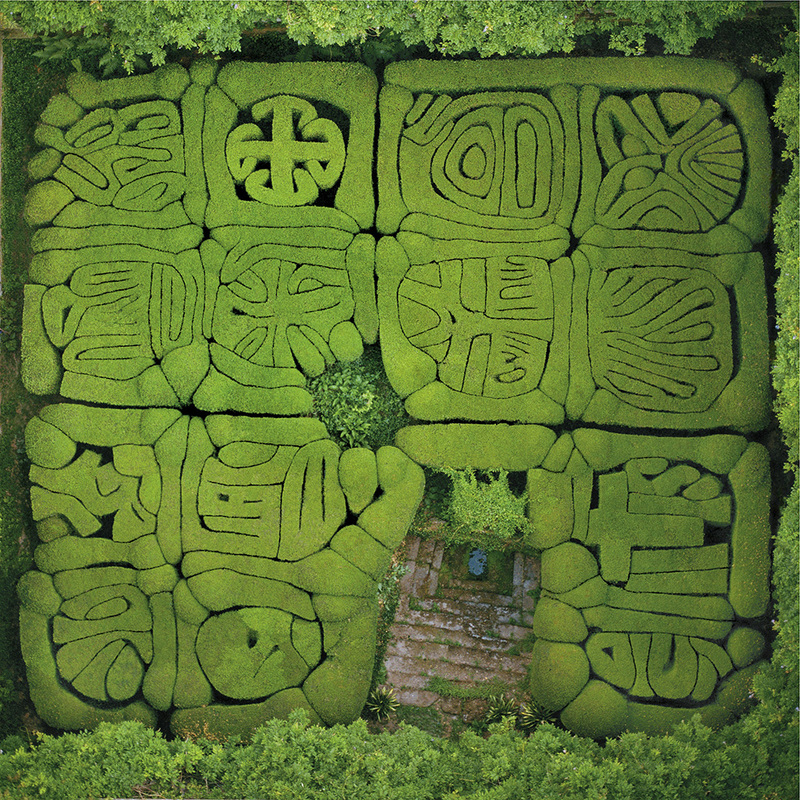 Cut out of box shrub, this work of art stands out for its symbolism and its longevity (four centuries); it is pruned by the gardener twice a year. One can still distinguish a part of allegorical designs, other ones being hidden, maybe forever, in the shrub’s enigmatic composition. Above the water fountain situated in the heart of the cloister there is a beautiful image of the Virgin dating back to XV century. The church of San Lorenzo always surprises its visitors by its beauty and proportions. There are still remains of the primitive Romanesque construction that can be found in the inferior part of the church. The high altar stands out, being the work of XVI century Italian masters, executed in Carrara marble and transported in 1840 to Pazo de San Lorenzo from the convent of San Francisco of Seville, where it was installed and which formed part of the Marquises of Ayamonte sepulchral ensemble situated in either side of the church. Of the utmost beauty is the statue of the Virgin with the child, work of the sculptor Martínez Montañés, situated in one of the side altars of the church. Rosalía de Castro, the most celebrated Galician poet, immortalizes the Pazo de San Lorenzo in her renowned poem collection of Follas Novas (New Pages) with a March 1880 poem. tan sóio de cousas tristes. ¿Onde estaba o sagrado retiro? tan sólo de cosas tristes. en la tierra os rodeara. ¿Dónde estaba el sagrado retiro? sumergida en los lodos mundanos. 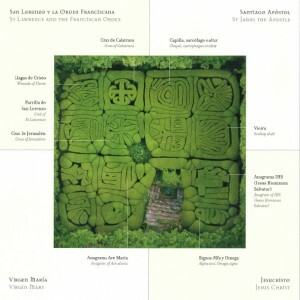 Translation of Helena Villar Janeiro and Xesús Rábade Paredes.